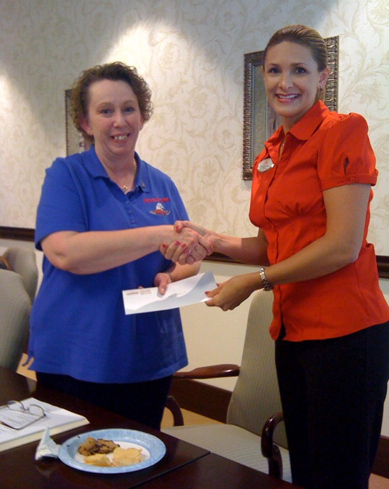 Melissa Snively, co-chair of FishHawk Boyette Lithia Area Council, presents a check to Sharon Richmond, of Operation Patriot. The FishHawk Boyette Lithia Area Council, an extension of The Greater Brandon Chamber of Commerce, is collecting for veterans. The residents of Baldomero Lopez State Veterans Nursing Home, located at 6919 Parkway Blvd. in Land O Lakes, receive only $35 per month to purchase everyday personal needs. One hundred twenty veterans from World War II, the Korean War, the Vietnam War and the Gulf War reside at this home. For most residents, this is all the money they have. Some of their needs are Depends briefs, denture cream, denture cleanser, Kleenex, toothbrushes, shower gel, hand cream, body lotion, foot powder, body powder, toothpaste, glue sticks, large print crossword and word searches, water color or acrylic paint and brushes, water color paper, black velvet paint-by-number, packs of construction paper, color tissue paper and gift cards to Walmart, Target and McDonalds. Please, no toilet paper, used/ opened items or medical/ medicinal items. Collect your donations from now until October. Notify Operation Patriot, a 501(c)(3) organization, to come pick them up and deliver them on Veterans Day. A portion of the FishHawk Lithia Boyette Area Council Evening Fest went to them ($500) and the group also collected about $300 in school supplies to donate to the YMCA. The event had a tropical theme and Music Showcase of Brandon won the “Best Decorated Booth” award. The next evening fest is scheduled for Thursday, December 2, and will be a holiday theme. Cash donations will be accepted and items will be purchased. Make checks payable to Operation Patriot. For more information, please call Sharon Richmond at 244-8403, Sergeant Ken Escobio at 477-1813 or Deputy Bobby Howard at 714-8708. The FishHawk Boyette Lithia Area Council is a local council of businesses in the area that support each other and the community by becoming involved. It is part of The Greater Brandon Chamber of Commerce and encourages local businesses to become members. It meets at 12 Noon every other month at The Palmetto Club, located at 17004 Dorman Rd. in Lithia, and has a social on the off-month. For more information on the council, please contact Amber Aaron at the chamber, located at 330 Pauls Dr. in Brandon, by calling 689-1221 or stop by Monday-Friday from 9 a.m.-5 p.m. The Baldomero Lopez State Veterans Nursing Home opened in 1999. The 120-bed facility provides care for residents, including those with dementia. It received the Gold Seal for Excellence in nursing home care in 2005. For more information on the nursing home, please call 558-5000. For more information on Operation Patriot, please visit www.operationpatriot.org.